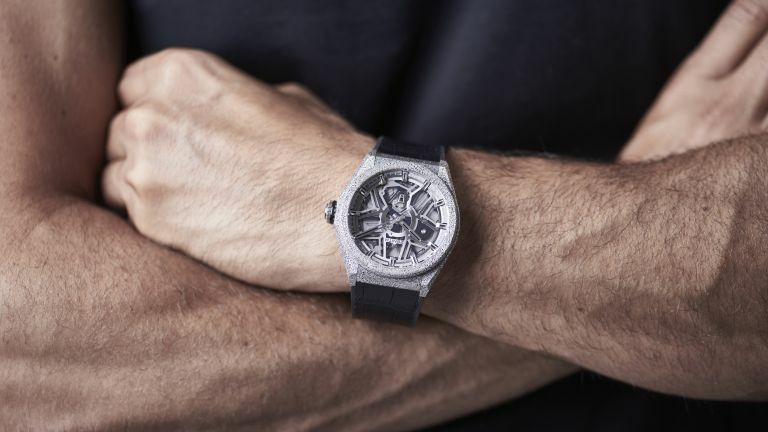 Zenith has just unveiled the Defy Lab, which claims to be the most accurate mechanical watch every made. Quite a claim, we know. The Swiss watchmaker has achieved this by inventing a new single-piece oscillator, which replaces the traditional hairspring/balance wheel assembly. Instead it contains the Caliber ZO 342, a singe-component oscillator, which vibrates at a remarkable 15 Hz (or 108,000 vibrations per hour). This is around five-times greater than a standard mechanical timepiece. The new oscillator is made of monocrystalline silicon, and replaces the standard 30-component regulating organ. This eliminates traditional assembly, adjustment, testing and lubrication, and reduces wear and tear. Despite the high frequency, the Defy Lab has a 60-hour power reserve, and it's daily rate is precise to within 0.3 seconds. For comparison, to achieve an official COSC chronometer certification the piece must been accurate to between -4 and +6 seconds. It's not just inside Zenith has pioneered. The case is made from 'Aeronith', an ultra-light aluminium alloy which is 2.7x lighter than titanium, and 10-percent lighter an carbon fibre. I think it looks awesome as well. Zenith has made a series of 10 introductory pieces, each priced at 29,900 Swiss francs (around £23,000). But, if you missed out, the Defy Lab and Caliber ZO 342 is expected to go into serial production in the first quarter of 2018.